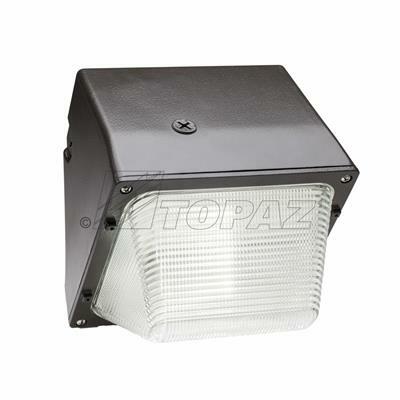 For general area lighting, Topaz's LED Wall Packs are a highly efficient solution. These lamps provide a long-lasting, cost-efficient option to high pressure sodium, metal halide and other traditional lights. Designed with a prismatic lens, these fixtures make the most of their highly efficient LEDs and create a widely distributed light to illuminate large areas. Constructed with a rugged, powder coated die-cast aluminum housing and featuring an operating expectancy of greater than 50,000 hours, these lights can last for years in all types of environments including warehouses, factories, restaurants, shopping areas and parks. The housing is designed to be mounted on junction boxes or direct wall mounts with feed-through conduit access for easy installation. An optional photocell can be installed for additional energy control.